Group posts pictures of 'first Torah reading' at Kotel women's section breaching regulations and tradition, after sneaking in mini scroll. In January the ultra-liberal Women of the Wall (WoW) group denied they tried to smuggle a Torah scroll into the Western Wall (Kotel) plaza in breach of the regulations - on Friday, they proudly posted pictures online of a miniature Torah scroll they smuggled in, read from and danced with. Rabbi Shmuel Rabinowitz, the rabbi of the Kotel and Holy Sites, criticized the small group that held its monthly Rosh Hodesh (Jewish new month) prayers at the Kotel women's section in open disregard of Jewish tradition, despite the fact that an Ezrat Israel egalitarian section has been prepared specifically for them further down the Wall. 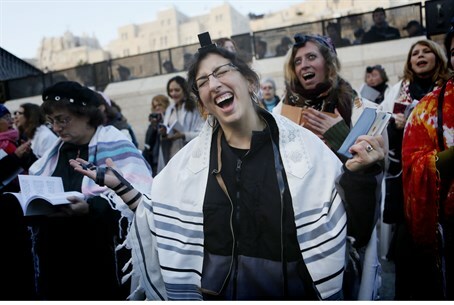 "A small group of ‘Women of the Wall’ acted deceptively this morning, and after they were prevented from bringing in a large Torah scroll, they deviously snuck in a small one to the women’s section," reported Rabbi Rabinowitz. The rabbi said he avoided directly confronting the small group out of fear the Torah scroll might be damaged in trying to remove it, but added "in the future, efforts will be made to ensure that this event is not repeated. No Torah scroll will be brought in to the Kotel, something which is not permitted for anyone - man or woman." WoW's insistence on conducting services with a Torah scroll - including the blessings over the Torah reading - directly contravenes Jewish law which mandates that such blessings can only be made by someone fulfilling a Torah obligation; since women are exempt from the time-bound obligation of reading from the Torah, the blessings are recited in vain which is strictly forbidden. However, WoW was not trying to hide their smuggling in of the miniature scroll, instead posting a picture of the Torah reading online, flaunting the regulations that are meant to guard Jewish traditions and the sensitivities of visitors to the site. On the group's official Twitter page they likewise lauded the incident as "the first Torah reading and bat mitzvah in the womens (sic) section of the Western Wall." The reference to the "first bat mitzvah" comes after a controversial ad campaign by the group on Jerusalem buses showing a girl telling her mother she wants a bat mitzvah at the Kotel, which the traditional group Women FOR the Wall (WFW) charges is really a push to change the status quo at the site regarding Torah readings. Leah Aharoni, co-founder of WFW, accused the group of seeking attention despite receiving the Ezrat Israel section, saying of it "Jews are voting with their feet and almost nobody is choosing to pray at the section that WoW has claimed to be so essential." WoW's Chairperson Anat Hoffman last July wrote an article in the Religious Action Center for Reform Judaism website entitled "support our rally to end the chief rabbinate." After casting various accusations, Hoffman concluded that "it is time to throw out the whole rabbinate."